When do you know that your neighborhood is dangerously close to becoming yet another hypergentrified hellhole? 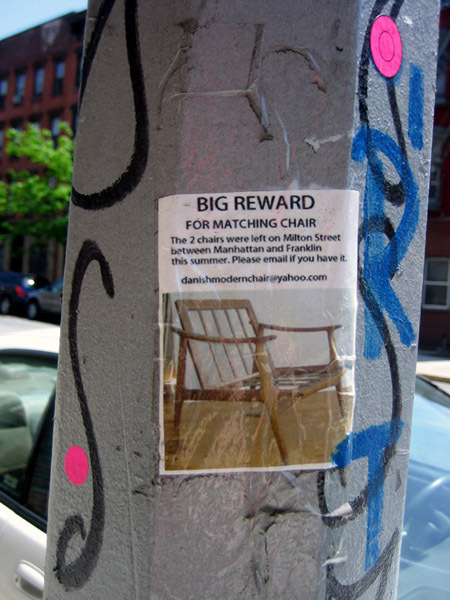 The day you find a flyer offering a “Big Reward” for a stolen Dutch Modern chair, that’s when. NICE. I too have seen an old Polish broad lift up her skirt and let ‘er rip. It was about 5 years ago on Manhattan Avenue. Right by a bus stop, no less.